Designing for the future alumnus, Brighton-based artist Jack Durling has just unveiled his latest body of work, “Oil Slick, Sea Birds”. 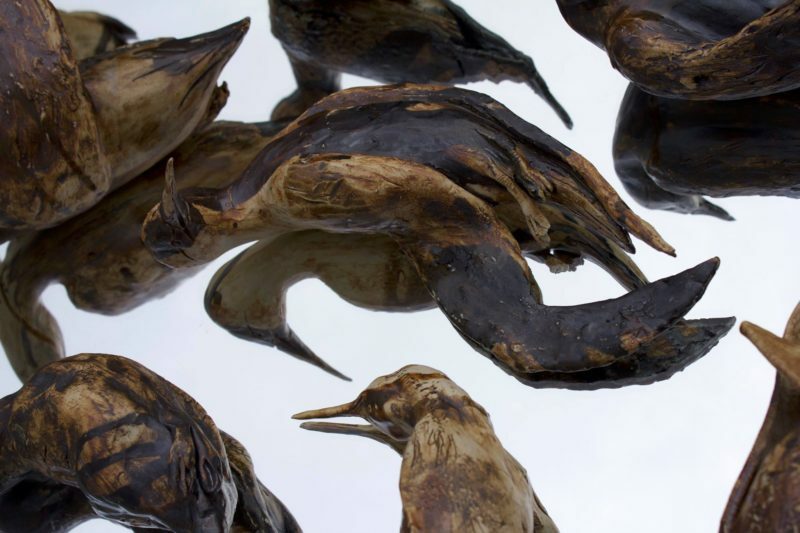 Having a passion for conservation and the preservation of wildlife, Jack has used clay to highlight and explore the very real problem of the consumption of oil, focusing on how this directly affects sea birds. Oil slicks, such as the BP Gulf Oil disaster, have become one of the greatest man made disasters affecting the environment. To this day the clean up continues and the damage it has caused is unprecedented. These pieces seek to speak to people about pollution and the pain inflicted on a great numbers of birds, capturing their struggle. Using layered glaze upon individual hand-built, hand-coiled sculptures, collectively they are bought together as one, to deliver a greater message.